KOLKATA: Thailand’s Pariya Junhasavasdikul regained the sole lead in round three of the McLeod Russel Tour Championship 2016 after he shot the day’s best score of four-under-68 at the Royal Calcutta Golf Club (RCGC). Pariya, the leading foreign player in the field, totaled 14-under-202 after the penultimate round to enjoy a two-shot lead at the Rs. 1.5 crore PGTI year-ending event. Delhi’s Rashid Khan stayed in touch with the leader after a third round of two-under-70 to be second at 12-under-204. He thus kept his Rolex Ranking title hopes alive. Kolkata’s SSP Chawrasia, the winner of the tournament’s inaugural edition in 2012, came up with a third round of three-under-69 to lurk in third place at nine-under-207 and remain in contention. Rolex Ranking leader Shubhankar Sharma (70) of Panchkula was a further shot behind in fourth place. As things stand, he is still the best placed to win the Rolex Player of the Year title. Two-time Asian Tour winner Pariya Junhasavasdikul (66-68-68), the joint second round leader, was off to an explosive start in round three courtesy a hot putter. The wire-to-wire leader birdied the first three holes with conversions from a range of 10 to 30 feet. He added another on the eighth to make the turn at four-under. Pariya then had a quiet spell till the 14th before an excellent recovery from the bunker and a 12-feet conversion helped him pick up his fifth birdie of the day on the 15th. His only blemish was the bogey on 16 where he missed an up and down from 50 yards. The 32-year-old Pariya is now in line to become the first foreigner to win the McLeod Russel Tour Championship. Pariya said, “I feel my performance so far is a reflection of the fact that I’ve really enjoyed myself coming to Kolkata and the RCGC for the first time. I love the atmosphere, the spectators, the people and the food here. “I had a better start than expected and that made it easier for me later on in the round. However, the course still presented quite a few challenges as was evident from my even-par on the back-nine. “Even a six-shot lead is not enough at this venue, so I’m not going to relax at any stage in the final round. There are a lot of big Indian names chasing me, especially Rashid Khan, so it’s not going to be easy. I just need to continue playing in the same manner. Rashid Khan (70-64-70), who shared the lead with Pariya in round two, slipped one position to second after mixing four birdies with two bogeys on Friday. Rashid, currently fourth in the Rolex Ranking, had a 20-feet birdie conversion on the fifth but also missed out on a 20-feet par putt on the last hole that pushed him two back. Rashid, a winner of two titles on the PGTI this year, said, “I have to work on my putting stroke as I missed a lot of putts which went to the right of the hole. Once you’re a little confused with your putting, it gets tough, as putting is half your game. I have to sort this out if I have to win tournaments. “There’s a lot to play for in the final round as I have to win if I want to seal the Rolex Ranking title,” added Khan. Kolkata’s SSP Chawrasia, lying tied third after day two, improved his position marginally as he closed the day in sole third. Local lad Chawrasia will be looking to roll back the clock to 2012 when he won the inaugural edition of the McLeod Russel Tour Championship after being four off the lead on day three. Panchkula’s Shubhankar Sharma closed the day in fourth at eight-under-208. As things stand at the moment, he is expected to finish on top of the Rolex Ranking, slightly ahead of Rashid Khan. Gaganjeet Bhullar (seven-under-209), Khalin Joshi (six-under-210) and Shiv Kapur (five-under-211) occupied the fifth, sixth and seventh places respectively. Jyoti Randhawa and rookie Aman Raj were joint 10th at three-under-213. As things stand, Patna’s Aman Raj is expected to end up with the highest earnings among the rookies and as a result win the PGTI Emerging Player of the Year title. Jeev Milkha Singh and Mukesh Kumar were a further shot back in tied 13th. The Kolkata duo of Rahil Gangjee (one-under-215) and Arjun Atwal (four-over-220) were tied 16th and tied 38th respectively. 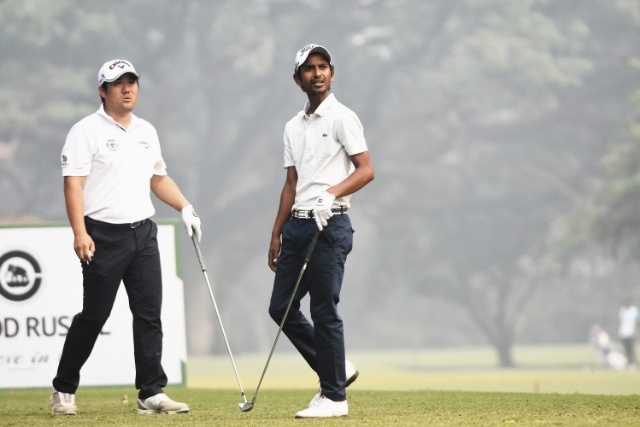 Reigning Rolex Ranking champion Chikkarangappa, also the defending champion of the event, was placed tied 35th at three-over-219.